Clicking on any image on this page will generally take you to a larger version of that panoramic. When I started taking road trips out West, I was never satisfied that I could only get a portion of the vast landscape in frame. Special cameras and wide angle lenses captured a wider angle, but was concentrated on the same 35mm negative/slide. That meant less detail. It got considerably worse, when my standard medium went from a 3:2 ratio (35mm) to a narrower 4:3 ratio (standard point-and-shoot digital images). The answer, obviously, was to take multiple pictures and digitally stitch them together. There are a few panoramics as early as 2001, where I experimented with the digital still-camera function on my video cameras. 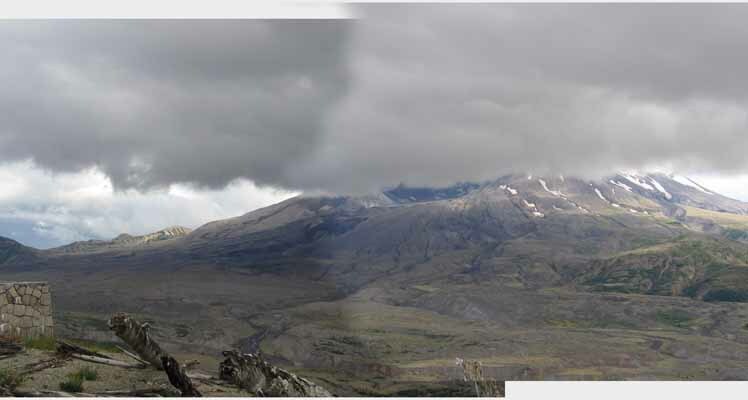 I think my first real attempts at high-definition panoramics was late in 2001, where the Beartooth Mountains demanded wider shots. However, the number of panoramics increased dramatically in 2002, when digital replaced film, and taking 200 images cost the same as taking one. Experimentation cost nothing. Things really took off when faster, more capable and stable hardware and software became available. 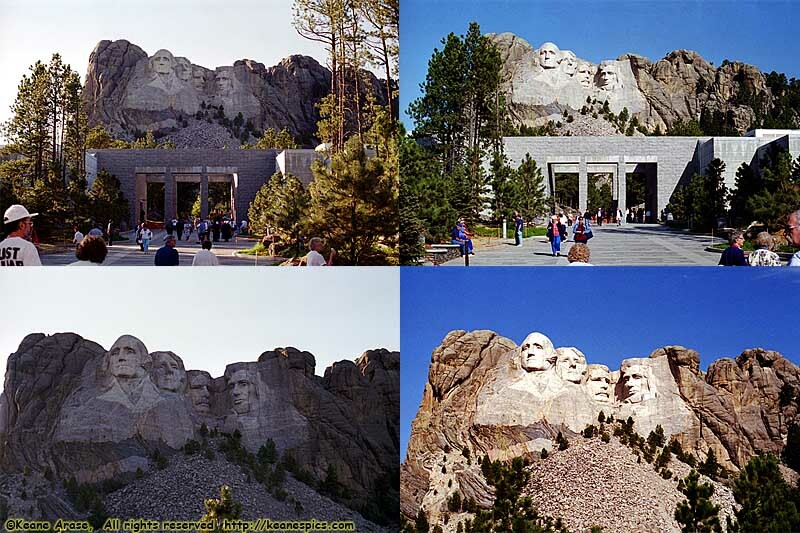 There are now hundreds of panoramics on this site, none are re-cropped single images, but are multiple images joined together. My technique to do these has vastly improved over the last decade, and I've fixed (or replaced) many of the older panoramics, but I haven't done them all. I did try to fix the more egregious errors in the earlier attempts, though some remain pretty bad. In many cases, the images were taken with such early digital cameras, that they may not be worth fixing. This allows me to print full size panoramics up to 13" wide (or tall) with photo detail. Why do they look that way? First, let's discuss why some of the panoramics look the way they do. 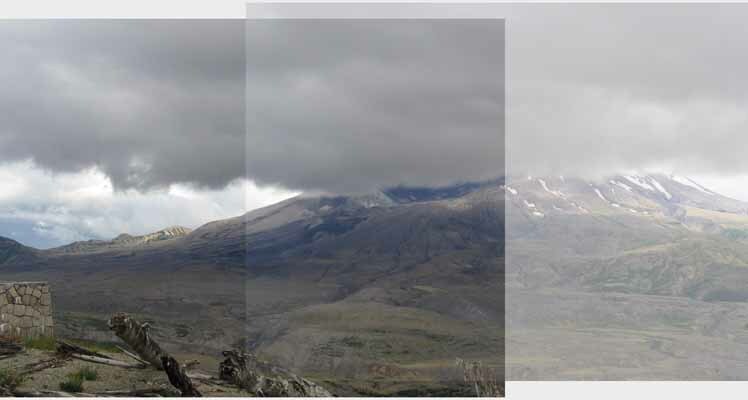 For the most part, a panoramic of a landscape looks exactly how you think it should look. Let's pretend for a moment that you have a straight street in front of your house that runs North-South. Go out to the edge of the street, close one eye and limit the field of vision of the other (like putting both hands next to the eye so you can only see a narrow view.) Look North. What you will see is the edge of the street running directly away from you, with an imaginary street on one side, and imaginary lawns on the other. In the example above, your view North has a parking lot on the left side and some badlands on the right, with the edge of the parking lot running directly away from you. Turn 180 degrees and look South down your imaginary street. What you will see is the edge of the street running directly away from you, with the street and lawns on the opposite side from your North view. So the edges of the parking lot in the example above, isn't two separate parking lots, but the same parking lot as you turn around in a complete circle. Another way to look at it, if you printed the panoramic out and taped it into a cylinder with the image on the inside, then stuck your head your head into the middle of it, you would see the parking lot on one side and the badlands on the other, and as you turned 180 degrees, you would be looking at the other edge of the same parking lot. But why do some straight lines curve? The road in the example above is a straight road. There are two (primary) reasons. The first, is I'm standing in one spot and taking a series of images, as shown at the top. The second, is I'm standing off to one side of the road. Due to both, the perspective distortion causes the road to curve. 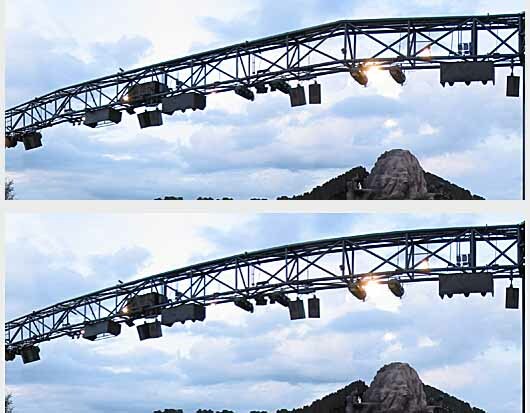 Notice the individual images close to the center have the opposite side of the road close to 90 degrees to the frame, but as you go to the edges, the angle of the road increases. The images are literally bent to blend the discreet angles in each individual frame. (I'll talk more about this later.) It isn't cheating, I could show you the actual mathematical proof on why the panoramic should be curved, but I'm not going to. :-) What is cheating, is the roads at both edges look like they're going straight off into the horizon, but in reality should be a bit more curved. The same is true with the edge of the road closest to the camera. Now let's talk about how to create a panoramic. Stitching programs can sometimes do a decent jobs on landscapes, where there's little movement, and no perspective distortion. However, once you get past that stringent requirement, those programs start to have problems. People move. Colors shift. Imprecise distortion correction. They all lead to very noticeable problems. They try to compensate by asking the focal length of your lens and distort the picture, but they still can't know the exact circumstances of how you took the image sequence. This all results in objects not lining up, people being cut in half, duplication of objects at the seams... It was all very distracting. You should use a tripod. Okay, I never do, unless I'm shooting at night. If you don't, you'll have to train yourself to keep the camera level and keep each exposure on the same horizontal plain. You *must* overlap the images. Generally an overlap of 30-50% is ideal, any more than that is counterproductive. 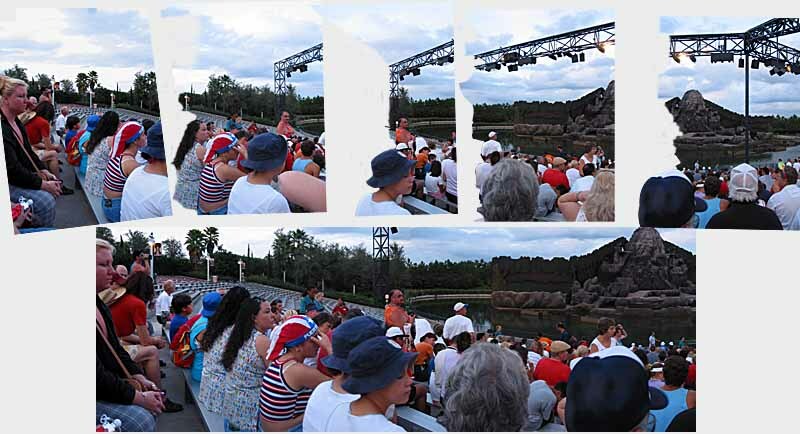 Anything less than that, and you run the chance of blank spots on the panoramic because you didn't have enough to cover when adjusting the individual images that make up the panoramic. I'll discuss this later. If you don't use a tripod, try to keep the camera level without any vertical movement between frames. Some cameras, like the Canon G series digicams, has a panoramic helper to line up the panoramic. (Which I've never used...) It doesn't matter if the individual pictures are in a vertical or horizontal format, so long as you're consistent. Generally, here are the steps I take blending the separate images together. I use Photoshop. It's what I know, and I've been using it since... version 4.5? So I'm using Photoshop terms (in italics), so translate to your photo editor accordingly. 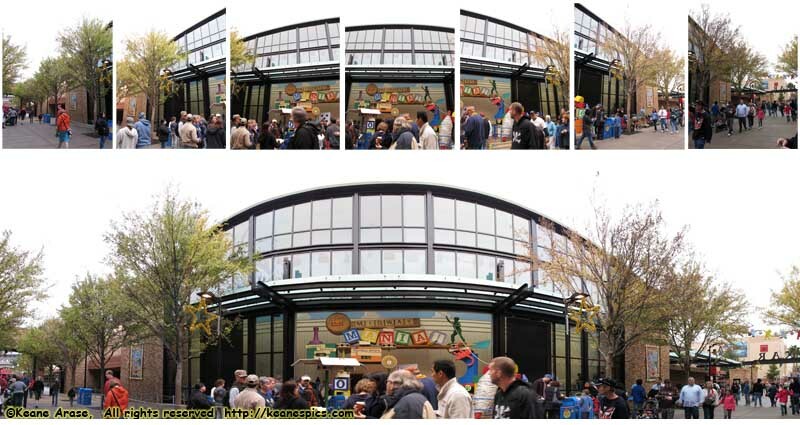 Identify which pictures within your picture set are panoramics. This may sound stupid, but I have actually found panoramic sets years after I've taken the pictures. They are generally easy to identify if you take the sequence from left to right, but if you take a sequence from right to left, it may not be as apparent. Create a blank sheet, and move all of the images to it in sequence, as individual layers. Warning: I've had very large initial Photoshop documents, some as large as 900MB. 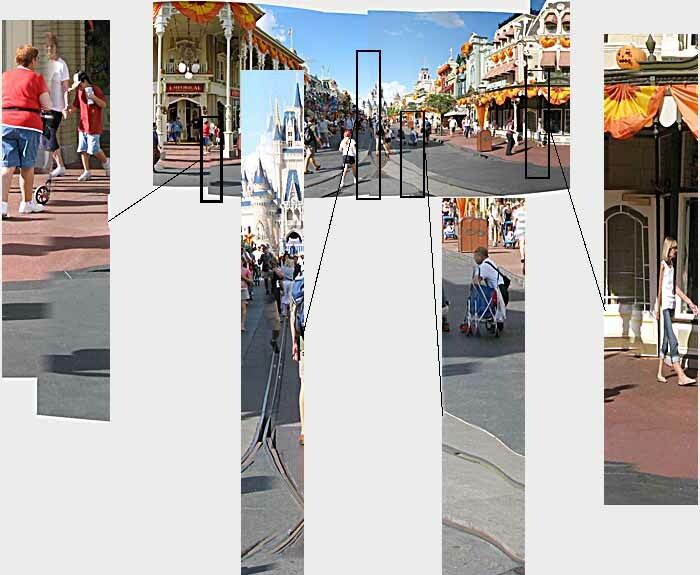 Correct any obvious errors for each individual layer, such as a picture being unlevel or perspective distortion. Don't try to adjust brightness or color balance at this time. 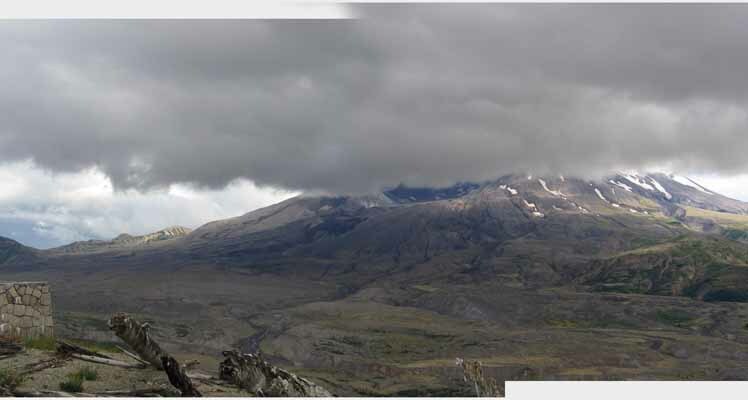 3) Continue with the rest of the panoramic, joining each new image to the newly forming panoramic. 4) After your done joining the entire panoramic, you have to go back and start to adjust the brightness and color balance. This is where you *really* need to know how to use your editor. Brightness differences can be compensated using Levels and Brightness/Contrast. Color balance can be adjusted with Color Balance, Hue/Saturation and in extreme cases, replace color. Each of these commands, while similar, has their differences. Experiment, that's all I can tell you. Here's a link to a panoramic of a sunset over the Gulf of Mexico. It took me years (on and off) for me to get this close, and as you can see, I still don't have it right. 5) Once the entire panoramic is done and looks consistent, flatten the image, crop, adjust the levels and sharpen as necessary. Once you do that, if you can still see the seam, you have to go back a step and re-balance the individual pictures. And a bit of advice, save generational copies of the panoramic. I generally save a copy of the raw images before joining, another copy after joining the pics, another copy after color correction, and another copy after cropping the pic, and another final copy after resizing and sharpening the panoramic. You never know when you'll find some problem that makes you go back and have to start over. Saving multiple copies will hopefully save you some work. 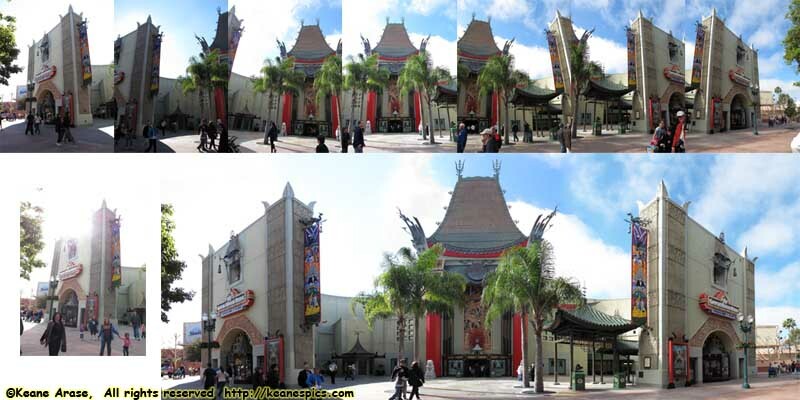 I would also start with two or three image panoramics, and work your way up. There are some issues that warrant discussion. Things beyond your control that will ruin your day. Most of them are optical physics phenomenon that you'll have to find a way to deal with. Look at this collage. What's the difference between the images on the left, and the images on the right? It's impossible to stitch a panoramic without correcting for this. Should you try, you'll find that your panoramic will start to form an arc, like slices of a pizza. Below is probably the most extreme example that actually worked. The distortion is pretty bad because of the proximity of the building (I'm almost right in front of it), and the wide angle focal length I was using. Before it could be stitched together all the individual pictures needed to be corrected for barrel and perspective distortion in two dimensions. This panoramic also demonstrates the ability to come back later and reshoot a bad picture. When I first took the panoramic at 10:30am, the sun was over the building (lower left). So we went on the attraction and when I came out, the sun was behind the building. So the first two images in the actual panoramic were taken 30 minutes after the rest. Top: Raw pics. Bottom left: Original first pic. Note how the sun washes the image out. Bottom right: Finished panoramic. Those darn people. If they'd only stand still... Or even go away... But they never do. Unfortunately, I can't tell you how to avoid cutting people in half, since the technique seems to change from panoramic to panoramic. This is a portion of a panoramic that does this. Note that this technique *duplicates* some people (which is why there are a couple of sets of identical twins in the image), but it doesn't look unnatural, like some photo from Back to the Future. Sometimes it involves erasing the image on top, and other times it's selective erasing so it appears the image in back is actually the image in front. 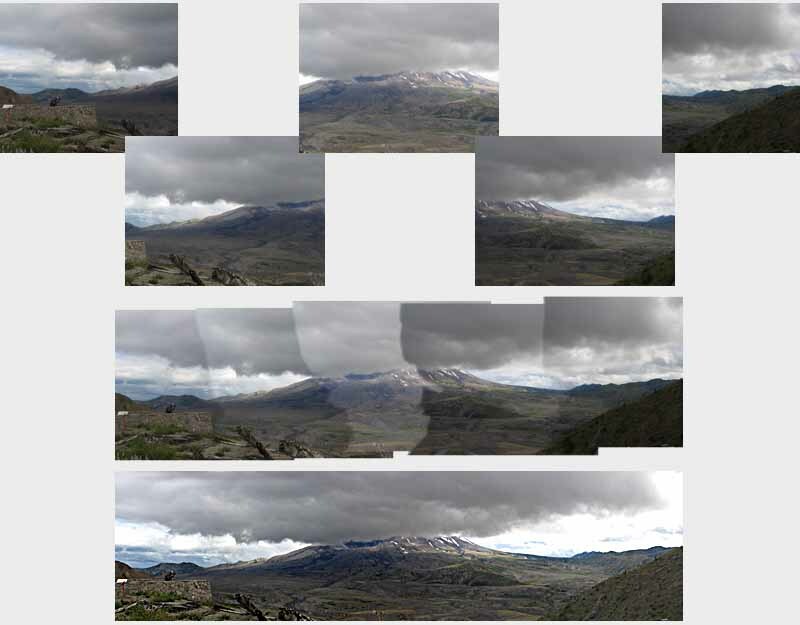 It's very easy to tell that the top image is from three discreet images as the perspective changes. The bottom one, not so much. It now takes minutes to do what before was almost impossible without a lot of work. You'll run into this problem anytime there's a straight line (usually a road) in your panoramic. It's beyond the scope of this page to tell you how to use Warp, and it's sometimes an art on how to warp the image on top and the image on the bottom, since this could change the other side of the image which has to blend with yet another image. Sometimes, things just fail. Here's an example of a 360 degree panoramic of the Boardwalk in Disney World. I was able to patch everything up except for a small area by Jellyrolls. The closeness of all the boards in the boardwalk, plus the tall building behind it was just too much to try to compensate for. I had to kinda paste the boardwalk itself back together, but there is a glaring error there. It's still a nice 360+ degree panoramic. This one of Glen Canyon Dam in Arizona actually worked out. This panoramic is composed of nine vertical frames, six of which compose the dam itself. The really hard part was getting both vertical and horizontal lines and stains on the dam to match up. This was difficult on a few levels. (It should be redone, but it would take me days. Maybe later.) This is the exterior of Toy Story Midway Mania in Disney's Hollywood Studios at Walt Disney World. One of the first things I had to do was correct each frame for vertical perspective and barrel distortion. This is made more difficult because it's a man-made building with vertical and horizontal lines, as well as being in a fairly close proximity. (The "street" this is on is called "Pixar Place" and is fairly narrow.) My first attempt at this panoramic had two major flaws. The first was I needed to start from the middle and work toward the edges, otherwise the finished image would look lopsided. 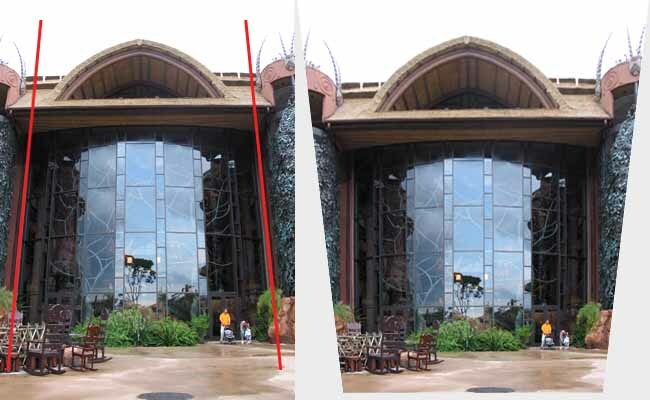 I also needed to establish where the eye-line was, and base the lower part of panoramic on that before attempting to blend the tops of the building. Should I mention the people and the trees? This is the Country Bear Jamboree at Walt Disney World. It was fairly easy, but it's a good example of an indoor panoramic. I've gotten to the point where I can stitch together somewhat close-quarter panoramics. This is the main room of a 2-bedroom villa at Kidani Village in Walt Disney World. One of the tricks is to make sure you provide a lot of overlap. This is even a smaller room than the one above. It's a Little Mermaid value room (not a suite room) at the Art of Animation Resort in Walt Disney World. I guess the final question is, why? I have printers (an Epson Stylus Photo R1800 and a Photo R3000) that takes 4", 8" and 13" glossy photo roll paper, so I can actually print these panoramics at full size. Imagine a 13" x 60" print that is sharp and photo quality over every square inch. They are quite impressive in person. They are for sale. At least the ones that have enough definition to be printed. (Some of the early ones do not.) E-mail (or use the "Contact Me" link for more information. Anyway, have fun and experiment. That's what it's all about anyway. 10/02/2014 - About this site page split.